The Fillmore Silver Spring is a new 2,000 seat concert hall located in Downtown Silver Spring, Maryland, providing world-class entertainment including rock, Latin, blues, jazz, folk, country and the spoken word. A unique public-private partnership between Montgomery County and Lee Development Group, the new music venue was designed to preserve the historic façade of the old J.C. Penney store site which was vacant for 18 years. 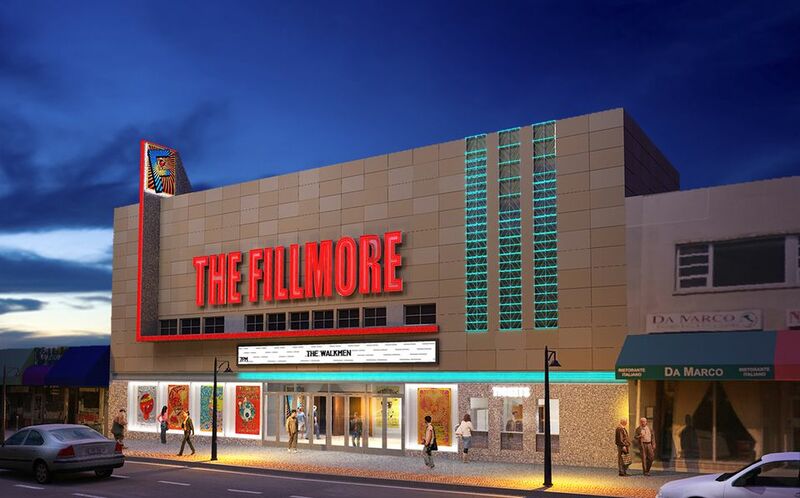 House Of Blues Entertainment (a Live Nation Company) and Montgomery County have entered into a lease agreement to operate the Fillmore Silver Spring. The 23,000 square foot music venue offers leading industry technology in audio, lighting and video as well as share fiber optic connectivity to American Film Institute’s Silver Theatre located across the street. With over 50 owned/operated and affiliated clubs and theaters, the House of Blues Entertainment portfolio is wide ranging including the legendary Fillmore music venues and the intimate House of Blues clubs throughout the United States. House of Blues Entertainment is the country’s preeminent live music venue collection featuring state of the art sound and lighting technology in one of a kind custom designed environments aimed tog fans and artists together in unparalleled musical environments. Artists like Dave Matthews Band, Coldplay, U2, My Morning Jacket, Lily Allen, The White Stripes have all performed on the Fillmore stages.